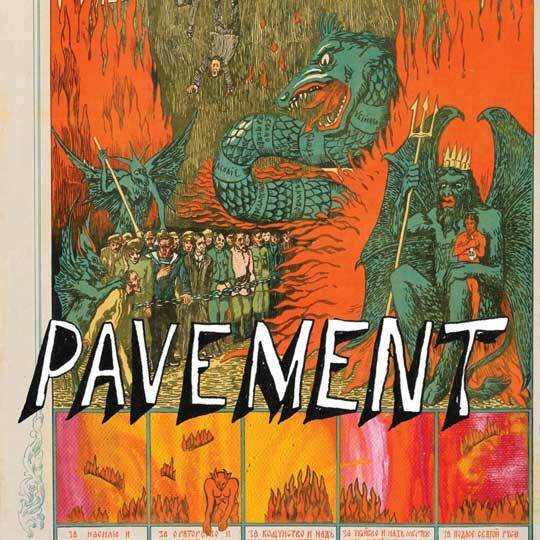 Quarantine The Past: The Best Of Pavement comes out on March 9, 2010. This fully remastered 23-track compilation will be available on MID-PRICED double LP, CD and digital album formats. The tracks span the entirety of Pavement’s career from 1989 to 1999, from the scratchy and mysterious sounds of their early vinyl-only releases to the rich, multilayered warmth of their final recordings. Although the compilation does not include any unreleased material, it definitely digs deeper than the hits. Quarantine The Past lands in stores as Pavement embark on their first live appearances since the fall of 1999. Dates begin in New Zealand on March 1 and continue through Australia and Europe over the spring and summer, with 4 dates in New York’s Central Park next September. More US shows will be announced shortly. First prize will be a pair of tickets, with flights and hotel rooms, to see Pavement at Central Park Summerstage on Tuesday, September 21, 2009 2010. Plus a complete set of Pavement Matador 12″ vinyl. Second prize will be having your track listing pressed up in a special limited-edition vinyl double LP for Record Store Day (April 17). You will receive 5 copies of your best of selection. Plus a complete set of Pavement Matador 12″ vinyl. Runner-up prizes will be complete sets of Pavement Matador 12″ vinyl. A few more clues: 3 pre-Matador tracks are included, plus one song that originally came out on a compilation. Every Matador album is represented, plus Watery, Domestic. Deadline for entries is 2 weeks from today: TUESDAY, JANUARY 19. Entry is open to anyone worldwide, with the exception of those listed under the contest rules and restrictions. And yes, a deluxe version of Terror Twilight is planned for next fall, to complete the deluxe editions of each Pavement album that we have been issuing every two years. who did the cover? Malk? it’s awesome! Nice to read that “Terror Twilight” is getting a deluxe edition. Every time there is new Pavement news, I get completely 13 year old girl giddy with excitement. Keep it coming! I already have my tickets to a few NYC shows, driving from Edmonton, Alberta, Canada. I bet you bastards neglected to put “speak, see, remember” on there – which is a crying shame y’all! Are you allowed to enter “both” competitions (ie the real guess and the imaginative one)???? when going for most ridiculous: do we need to pick from the pool? Argentina please!, south america needs you! Death to 180g vinyl! Very nice move, guys. It’s great to see a label putting out affordable records. Yes – you need to pick from pool. we’re dying here to see these guys! So no B-sides? I would definitely put “Sue Me Jack”, “No Tan Lines” and “Harness Your Hopes” on my best-of list. Am I the only one who only counts only 98 tracks on the list of ‘over 100 tracks’? How could you forget “GIVE IT A DAY”, one of the best Pavement track ever?! That is one kickass cover. Can’t wait for this! no, you’re not the only one. there are only 98 tracks…. Please come down to Buenos Aires. I find it kind of odd that the track pool is missing a load of B-sides and that the list does not include “Killing Moon”, which is considerably popular according to Amazon. The Best Of compilation is meant as an introduction for Pavement newbies as well as a survey of the band’s oeuvre, so it doesn’t include any B-sides or rarities to speak of aside from the one compilation track. Deeper than the hits = album tracks. For the contest, we only listed songs from the categories listed in the post above: each of the 5 Matador albums plus the Watery, Domestic EP, the compilation tracks, and the pre-Matador releases. If all the EPs, B-sides and rarities had been listed, then it would be nearly impossible to guess the correct track listing (and misleading as well). For the “imaginative” track listing, the contest is to come up with the most imaginative track listing within the limits imposed by the existing comp, i.e., again, the categories listed above. Sorry, no more hints – it would be unfair to the many people who have already entered the contest. So… by that comment are we to assume you’re hinting at the fact that we can only enter one entry? Well, I entered into the contest, but I sure wish I thought it through before I sent my entry in. oh well. I can’t wait to get the double LP. I reckon all songs from the first Peel session are amongst the best, but they have all been quarantined from the past! I’d also include no songs from Terror Twilight and really I wouldn’t include Gold Soundz either even though Crooked Rain is my favourite Pavement album. Actually most of their best songs weren’t singles! If it includes their awful cover of the Killing Moon or their worst song Carrot Rope that is a shame, but not the end of the world (yet). Just you wait until 2012! Did he vote for Shoot the Singer? YES you can enter multiple times! you couldn’t leave the contest open until midnight tonight? WTF? Matador, a deadline of 1/19/10 means until the end of 1/19/10! Well, this terrific band is reuniting so that’s all that really matters in the end. Thanks for holding this awesome contest! Aww i missed the date… had this ready but forgot that day.. duh. when will we know a) who won and b) the tracklist? Having been sent a CDR promo of the compilation today, synchronously the same day Steve West’s Marble Valley play a couple of minutes walk from where I’m posting this, I can remark that the track list runs together very well. Who compiled it? Although it omits my three favourites Grave Architecture, Texas Never Whispers and Circa 1862 the segues of Date w/IKEA into Debris Slide, Grounded into Summer Babe, Heaven is a Truck into Trigger Cut into Embassy Row into Box Elder make up for that. The one odd thing really is ending with Fight This Generation which doesn’t sound at all final. Maybe Here (which I seem to recall closed the original promo cassette running order for Slanted and Enchanted) would seem logical? I got about half the tracks right, but did it all rather cynically trying to guess what the label would choose rather than my genuine favourites (as three of them were not allowed). I tried to put Unfair in the running order and the computer wouldn’t recognise that song, which is odd as it is on the compilation! Maybe the machine I was using had an Unfair Virus? Thanks for the good vibes, B. Hell. Very strange about Unfair! Plenty of people were able to choose it successfully, based on the submissions. France please! Been listening to them for ages, one of my fav band ever!! interesting cover you got here. Next Next post: Shearwater’s Golden Dossier Funded!